How would you define your Portuguese ancestors who went to Hawaii? You might start by calling them Azorean, Madeiran, and Portuguese. You would call them Caucasian, wouldn’t you? But, would you call them White? Those who controlled Hawaii’s business and political interests in the 1870s did not. The Portuguese who went to Hawaii were officially classified as “Caucasian But Not White”. How is that possible? Aren’t Caucasians White? Notice that the definition states “having usually light skin pigmentation”. That is important. Today, we tend to see race issues as Black, White, Latino, Asian. But, back in the 1870s, it was more complicated. For instance, in America, Europeans from different countries were divided into groups. Do you recall any of your grandparents telling you that they lived in the French or Irish part of a city? That’s because each nationality had it’s own community within communities. My dad grew up in the French region of Oakland whereas my mom grew up in the Portuguese region. It was the same in Hawaii. Let’s look at the issue of skin pigmentation more closely. The first Portuguese to settle in Hawaii were the Cape Verdean sailors who are said to have jumped ship just off the Kingdom’s shores. 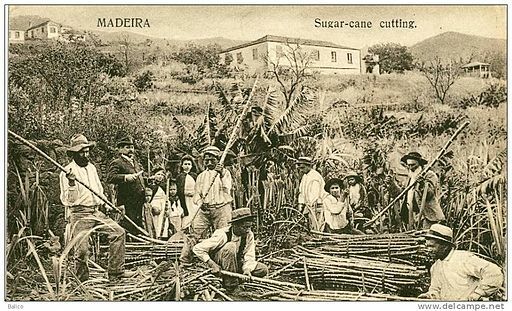 In the late 1870s, the first Madeiran contract laborers arrived, followed soon after by the Azoreans, and later in the century came the mainland Portuguese. Because the Cape Verdeans were the first to migrate, the Portuguese were defined by them. Although the Madeirans and Azoreans do not have as dark of complexions as the Cape Verdeans they were darker than the French, British, Irish, Scottish, and Americans who ran most of the business interests in the nation. By the time the sugar plantation era was in full swing, the race classification was firmly ensconced. The Portuguese were defined as Caucasian, But Not White. Why Does Race Classification Matter? Why is this so important? After all, it was just a term. If race was important in America, it was even more so in Hawaii where those in power tried to keep tight control on the size of ethnic groups, labor organization, and worker dissent. The system in Hawaii was hierarchical based on race and ethnicity. Equal work did not receive equal pay. The jobs you could be hired for and the pay you received were determined by race. 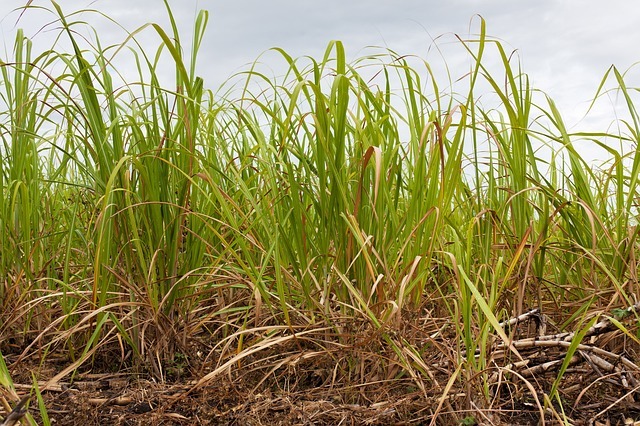 Let’s look at the sugar plantation system as an example. A White person from the right countries like the United States, Sweden, or Germany, was afforded more opportunity on the plantation and better pay. They could work anywhere in the fields, the sugar processing/manufacturing buildings, in the offices, and hold management positions. Their pay was set far higher at every level because of their “preferred” status. Asians, on the other hand, was seen as necessary but undesirable. There was a deep seated fear of any one Asian group becoming too large in the islands. Before 1900, they could only hold jobs in the fields or the manufacturing plants. By 1900, some were allowed to work in the offices as clerks or bookkeepers. But, they could not hold any type of supervisory position. They were strictly laborers. And, though they might hoe the same rows as their German counterparts, they earned only fraction of their wages. Where does this place the Portuguese? The Portuguese fell somewhere in between. Their wages were set lower than White Caucasians but higher than Asians and Latinos. They could not hold upper management positions, but they could work in supervisory positions. In the first decade or so, they could rise to luna, but not to overseer. These limitations loosened by 1910, though some positions were still out of their reach. I have used the term “preferred”. I don’t mean that the Portuguese were undesirable. By far! The Azoreans and Madeirans had been scouted and recommended because of certain traits. But, while one was desirable as a worker and as a member of the community, that didn’t mean they wanted that person marrying your daughter. With the patriarchal system in place in many plantations, the Portuguese were viewed somewhat like good, obedient children. It might surprise you to know that “Caucasian but not White” was an official classification. It applied to schools, the census, job applications, and anywhere else you checked a box for race. It wasn’t until the 1950s that the classification died out. You see small distinctions between how those in mainland America and those in the Territory of Hawaii were viewed. Take a look at the 1940 U.S. Federal Census and you will see the distinction in the way that the census was crafted. While in mainland America the abbreviation W for White was used for Europeans Americans of all sorts, including the Portuguese, it is not used in the Territory of Hawaii. There the abbreviation was Cau for Caucasian. In the legend at the bottom of each, you’ll notice that for the Territory of Hawaii, White is not an option, while on the mainland America form, Caucasian is not an option. There is probably an explanation in the census annals as to why they decided to have the two different terms for the same people. It is important to understand this to understand our ancestors and their times. How must it have felt to be classified as less than other Europeans simply based on the color of their skin? I would imagine they were far too overworked to think about it too much. 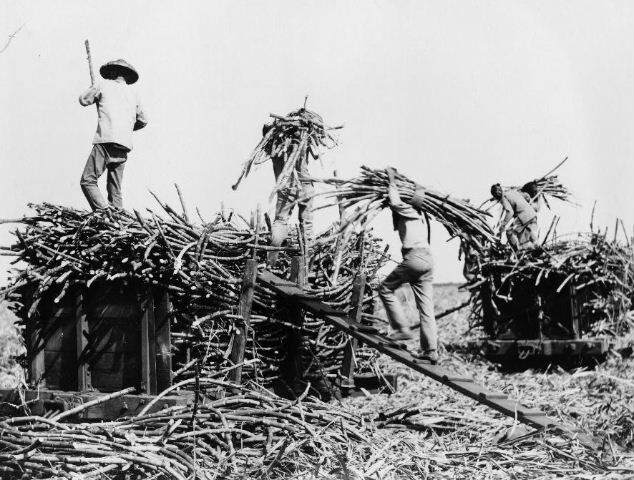 But, when they stood in line and showed their bangos in order to get their monthly wages, it must have stung a little to know that there were limits on what they could achieve within the plantation system. It must have felt worse to the Asians who worked just as hard but earned so much less. Source: Library of Congress, Prints & Photographs Division, [reproduction number, e.g., [LC-USZ62-1234] , Frank and Francis Carpenter Collection, no restrictions. It helps to understand this as it may explain why some of our ancestors fudged a little when asked where they were from. If you were a Filipino but could pass as Spanish, or a Portuguese who might pass as French, it would mean better jobs and better wages. You might be able to keep more food on the table, buy clothing and shoes for your children, and visit a doctor off the plantation when you or a family member were sick. You might be able to send your son to a better school where he learns a skill that keeps him out of the fields. I wouldn’t begrudge an ancestor living in these times who did so since it might mean a better life for their children. Things were far more complicated than we realize. Race in Hawaii was Black, White, Latino, and Asian–and everything in between. “Hawaii, A History: From Polynesian Kingdom to American Statehood” by Ralph S. Kuykendall. “Peopling of Hawaii” by Eleanor C. Nordyke. Also, to get a better idea of how the Portuguese Hawaiians were viewed by the Portuguese in California, refer to “Portuguese Immigrants: The Centennial Story of the Portuguese Union of the State of California” by Carlos Almeida, “Chapter IV: The Hawaiian Paradise” pages 14-24. This book is available from time to time in used quality on Amazon.com You may also find it at your local library or available via inter-library loan. This honestly sounds like the “Irish argument” or the “German argument” or the “Italian argument”. While at one time not all people with white skin were considered white in America, we are now white and profit from white privilege. Rose, Thank you for your comment. It seems each generation we just exchange one ethnic group for another when it comes to prejudice. I am sure that Hawaii in the 1880s reflected the opinion of race/ethnicity that was prevalent in the United States (and Western Europe) at the time. I have enjoyed a the articles. I was born of Hawaiian /German mother an Portuguese father. My mother WS born on Kauai. I don’t know where my father was born. I know the name of my mother and father. They were not married. My mother was sent over to San Francisco to give birth of me. I was adopted by a wonderful Portuguese couple when I wa about 2 weeks old. I have lived in California all my life. Susan, Your mother’s story is a common one for the times, I think. Though, this is the first time I’ve heard of a woman being sent from the islands to California to give birth. I am glad that you were adopted into a nice family and that you know the story. You mentioned that your father was Portuguese and you know his name. I was wondering what his name was? I know quite a bit about the Portuguese families of Kauai and was just curious if I might recognize the family (unless it is a very common name, that is). Thank you for stopping by and sharing your story! Im portuguese and living in Hawaii for a year. Could i post a link of you website on mine? Whats the best way to talk to you about it? Tiago, Thank you for your kind words. I have sent you an email about linking. LBradley, thanks for commenting. Where abouts in Portugal was your grandfather from? Did he go to Hawaii?